A theme. An elegant theme. An elegant, minimal, and responsive theme. 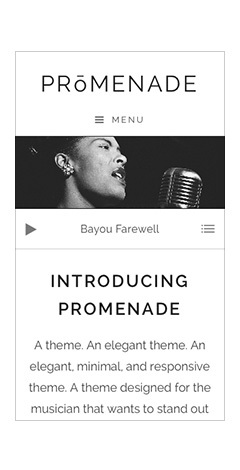 A theme designed for the musician that wants to stand out with grace and beauty and class. That’s Promenade. Beautiful fonts make for a much better browsing and viewing experience. This is why with Promenade we’ve built in the ability to customize your theme with 30+ hand picked Google fonts. If you’re a Typekit customer, we’ve got you covered there too. 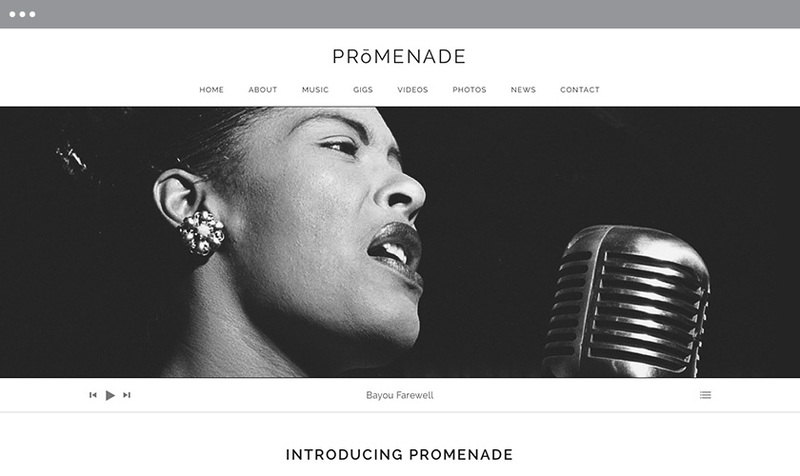 Promenade’s homepage is designed to showcase all of your most important content in a very clean, elegant, and visually attractive way. Use the “Featured Content” area to make sure your best articles get noticed. 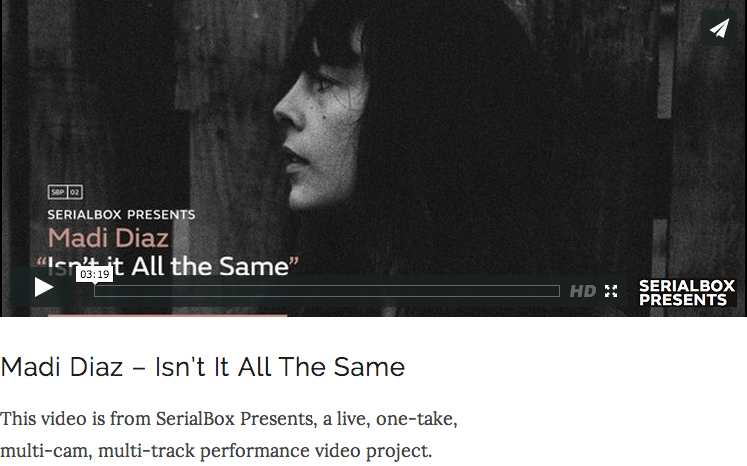 In the same manner, showcase a featured image or display a custom audio player to highlight one or more tracks. 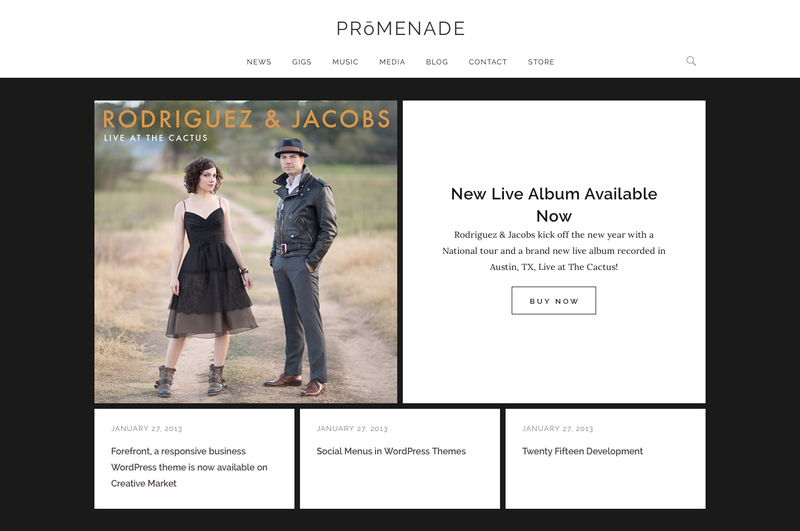 Did we mention Promenade’s Home page template is widgetized? Showcase your audio, videos, gigs, and custom text in any order you like by adding any number of AudioTheme’s custom widgets or text widgets to the home page sidebar area. On single record pages, Promenade displays your tracks in a clean and simple tracklist, allowing users to listen and sample your music. Each track in the tracklist links to an individual page where you can add lyrics, download links, or even tablature — it’s up to you. In addition to the record artwork, featured to the left of the tracklist, you can also choose to display record purchase links, download links, and record info. 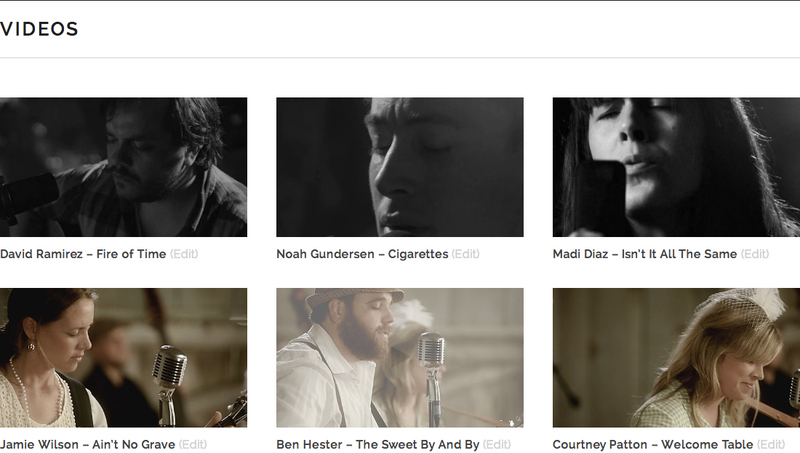 If your fans are anything like us, we love to watch music videos. With Promenade, you can prominently feature your video at the top of each video page, filling the full width of the content area. With the help of the AudioTheme framework, managing and displaying your video library is a breeze. Add your latest YouTube, Vimeo, or other supported video service by simply providing a URL. Promenade will take care of the rest. The best way to connect with your fans is in person! Let your fans easily find out where you will be playing next along with all the event details; time, date, venue information, maps, etc. After adding information for a venue, Promenade will automatically display a customized Google map image, matching the map colors to the overall appearance of the theme, and linking to the official Google maps page for more directions. Along with showing ticket information and purchase links, Promenade displays quick links for your fans to download iCal and Google Calendar with all the venue information. This makes things quick and easy for fans to subscribe your gigs, ensuring they won’t forget when you’re in town. Aside from the home page and main sidebar widget areas, Promenade also features a large three-column footer widget area (under Appearance → Widgets). 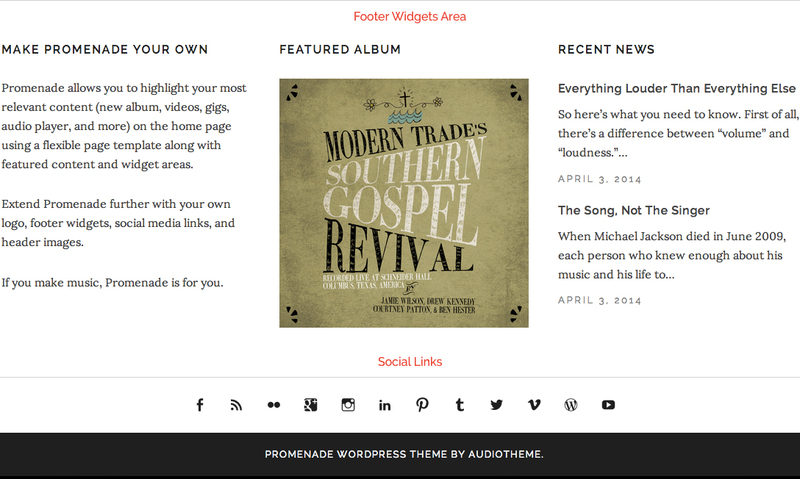 Aside from the default WordPress widgets, Promenade also comes with a support for all the AudioTheme framework widgets, allowing you to show off your latest videos, music, gigs, and more. Just below the the footer widgets is a Social links menu, which can be added via Appearance → Menu. Social icons are automatically displayed by simply providing the relative URL. For example, a link like http://twitter.com/audiotheme will display a Twitter icon. 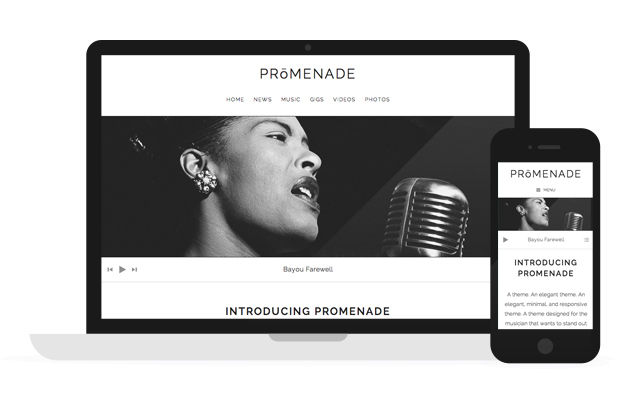 Promenade has a responsive theme design that adapts smoothly to different screen sizes, so your content will look beautiful on smartphones, tablets, laptops, and large desktop screens. You can customize Promenade very easily. The home page can show a featured content area, display a large featured image, showcase a custom audio player, and/or include a number of different widgets. Choose to set a number of columns or and a custom archive menu for Record and Video archives pages. We’ve also built in the ability to show featured posts at the end of single post pages, too, which can be enabled via the Customizer. Promenade also supports Custom Backgrounds, and you can add your own logo or other header image instead of the default site title, by uploading your image in the Customizer. For further options like Custom CSS, font changes, and more custom color options you can use a WordPress plugin for that; we can help you find the right plugin for the job. Built with HTML5, Promenade supports current and future WordPress features like HTML5 image galleries, comment forms, search forms, and more. Furthermore, Promenade includes Schema.org markup, increasing your site’s visibility and SEO results. Search engines including Bing, Google, Yahoo!, and Yandex rely on this markup to improve the display of search results, making it easier for people to find the right web pages. We’ve included the necessary markup for your videos, audio, and gigs to take full advantage of your site’s content and SEO juice. Related posts to help fans find content easier. Full Width page template to allow content to stretch the width of the page. Home Page template with custom widget areas. Display an image or text based logo. Support for Jetpack infinite scroll. Translation ready; change text into your language. Developer and child theme friendly.